My first computer that was a TRS (Radio Shack) Model 100 Laptop. 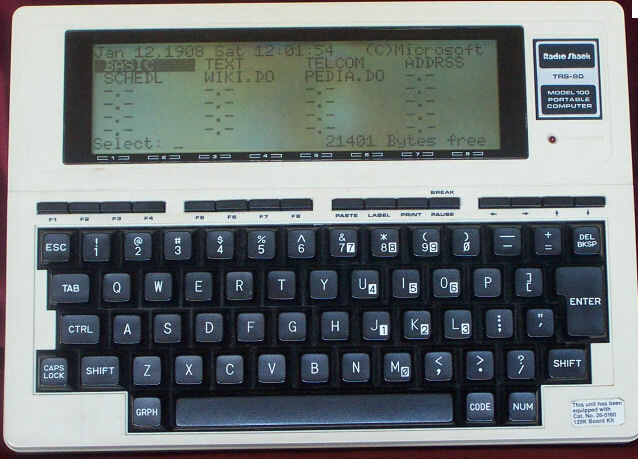 According to Club 100 User support group, the model 100 was the first laptop dating back to 1983. I’m not sure if it was the first but I got one around 1984 or 1985. I was shocked to find out that some people still “use” them. Mine had an extended memory of 32K (that is right K) and used an external tape drive for storage. It was really little more than a small electronic typewriter that didn’t print. I do not have found memories of that beast. It was unreliable and always crashing. There is a reason the old Radio Shack computers were nicknamed Trash 80. My phone has more memory and more functionality than the Model 100 (and I don’t have a smart phone). certamente vedere questo computer e quelli attuali di Jobs, fà un certo effetto. Sembra che faccia parte dell’era preistorica !!! E noi ? …. di noi resterà soltanto un granello di sabbia ! certainly see this computer and current Jobs, makes a certain effect. It seems that part of the prehistoric era! And we? …. of us will remain only a grain of sand! YW. Yes the Model 100 does look prehistoric. The micro sd card for my smart phone has more memory than it did.